It’s November again, and applications are already being circulated around the Comarca for the 2017 Few for Change Scholarship. It’s hard to believe that we haven’t yet introduced the scholarship recipients from 2016 because they’re an amazing bunch! We had the joy of meeting them in person at the February 2016 scholarship awards ceremony, after first getting to know them through their impressive applications. So, without further ado, let us introduce the seven new Few for Change scholars of 2016! Fourteen year old Fabian has a strong sense of purpose and clearly defined goals. He dreams of becoming an agricultural engineer to help Ngäbe farmers innovate and enter markets, thus generating income that can be used towards educating their families. Fabian takes inspiration from his grandfather, who did not enjoy the benefits of formal schooling, but volunteered extensively in his community and believed in the transformative power of education. Though nervous to meet us all for the first time, Sindy drew us in with her shy giggle and a bright smile. Though only in seventh grade, she hopes to build a nature reserve to protect various species of plants and animals so that we can recognize and understand their importance. She also likes to play baseball and dreams of a better life for her family. Olivia is also in the seventh grade; however, at 28 years old she is returning to school after not being able to attend for several years. Her father was not able to afford the costs of education, such as school supplies, and Olivia was forced to leave school. Now, she is working various odd jobs including laundering clothes and making naguas (the traditional dress worn by Ngäbe women) in order to pay her way through school and is determined to finish her studies after years of hardship. Leonel has had his share of ups and downs, but continues to remain positive and motivated to complete his schooling. When he started primary school, he lived three hours from his school, and had to leave at 5 am to make it to classes on time. He was often tired and hungry, and had to repeat fourth grade, but his family has since moved to be closer to his school (he is now in high school). He is very thankful for their sacrifices and looks forward to a bright future. “Power is want.” This phrase, which Xiomara used in her application, perfectly sums up her can-do attitude. She told us of feeling sad and unmotivated as she walked to school without having food or school supplies. In spite of this hardship, she decided that these difficulties were not a reason to drop out of school, and she willed herself to succeed. One day she will be a doctor and work in her community to deliver first aid, health education, and support in difficult times. Seventh grade student Roger plans to one day be an English teacher - a goal inspired by a teacher in his community. Roger admires the care she shows to her very young students, and the creativity and commitment with which she approaches her job despite having no materials (including tables or chairs) and earning a low wage. Like the teacher, Roger won’t let a lack of resources get in his way, and looks forward to serving as a role model in his community. At only 14 years old, Denia is already a strong young woman. 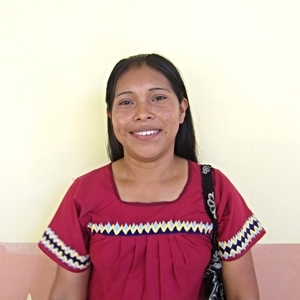 She wants to organize a women’s group in her community to educate about women’s rights and responsibilities, particularly with respect to education and educating their children. She wants to serve as an example for her younger sister, and help create a strong community that can serve as a model for other communities in the Comarca. With such a motivated and inspiring dad (her father is FFC volunteer Ramon), we can see where she gets it from.